Chinese 1 is part of a four-course series that takes students from novice through the upper intermediate level of proficiency in Mandarin Chinese. Through the four levels, students will be provided a foundation of listening comprehension, reading comprehension, writing, and speaking in modern standard Chinese so that they are able to communicate and interact within the context of a variety of everyday situations. 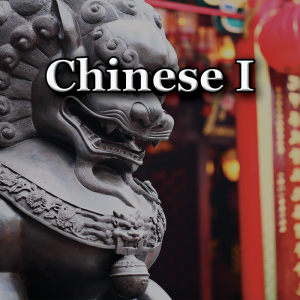 In Chinese 1, students will be first introduced characteristics of Chinese language, and then learn topics about common greetings, family, dates/times, sports and colors. By the end of the full year, students are expected to learn to speak and read approximately 503 new words/phrases, and learn to write approximately 205 words. Through the study of Chinese, students will also understand how Chinese as a language relates to, and is positioned in, Chinese cultures.